The chief components of clary sage essential oil are sclareol, alpha terpineol, geraniol, linalyl acetate, linalool, caryophyllene, neryl acetate and germacrene-D. The clinical uses for clary sage oil are manifold: it’s been demonstrated to have antioxidant antidepressant, antifungal,  anti-infectious, anti-microbial and anti-inflammatory properties. Combine that with its hormone-regulating actions, and this is a great herb for hormonal acne. Han, Sun Hee, You Ja Ro, and Myung Haeng Hur. "Effects of aromatherapy on menstrual cramps and dysmenorrhea in college student woman: A blind randomized clinical trial." Journal of Korean Academy of Adult Nursing 13.3 (2001): 420-430. Gülçin, Ilhami, et al. 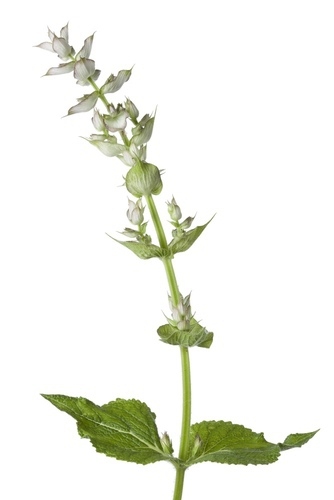 "Evaluation of the antioxidant and antimicrobial activities of clary sage (Salvia sclarea L.)." Turkish Journal of Agriculture and Forestry 28.1 (2004): 25-33. Seol, Geun Hee, et al. "Antidepressant-like effect of Salvia sclarea is explained by modulation of dopamine activities in rats." Journal of ethnopharmacology 130.1 (2010): 187-190. Pitarokili, Danae, et al. "Composition and antifungal activity on soil-borne pathogens of the essential oil of Salvia sclarea from Greece." Journal of agricultural and food chemistry 50.23 (2002): 6688-6691. Džamić, Ana, et al. "Chemical composition and antifungal activity of Salvia sclarea (Lamiaceae) essential oil." Archives of Biological Sciences 60.2 (2008): 233-237.